The Cowboy Birder: Iberian Chiffchaff on Wanstead Flats? After news of a second good fall of birds this spring on Wanstead Flats - details here: I got to the Flats on Saturday morning (27th) early in hope there might still be a few birds knocking around, but It was evident that most had moved on encouraged by the clear skies that evening - I struggled to find a Wheatear where there were up to thirty birds the previous day, I consoled myself with picking up my first Lesser Whitehroats of the year and a flyover Yellow Wagtail on this rather cold morning, the wind direction had switched to northerly after enjoying a couple days of relatively warm southerlies. Completing my large loop of the Flats in the scrub east of Alexandra Lake, I picked up a Phylloscopus Warbler working its way through the brambles, intermittently giving of a typical contact call 'hweet', 'hweet' - I ticked this of as another Chiffchaff and was ready to head home. It was at this point the bird came into view, and a lot closer, almost too close! I randomly fired off a couple of images on the camera, checked there quality, deleted a couple of dodgy ones (bad habit) and kept one. It was at this point the bird started to sing 'chiff' 'chiff' chiff', 'chiff' chiff' 'chiff' and this was repeated on a couple of occasions, broken up with the odd 'hweet" - odd calling Chiffy was my first thought! Aware that Iberian Chiffchaff was a possibility but with no previous experience of having seen or heard this species, I thought it would be best to check Xeno-canto when I got home before making any foolish assumptions. Having a young family to contend with is never conducive for your birding plans and it was late afternoon before I had a chance to listen to any sound recordings but what I heard sounded interesting, very interesting! It was at this point I got the message out to Mr Lethbridge and Mr Croft - "Listen out for odd calling Chiffchaff in the Alex scrub - all Chiff and no Chaff" I jokingly remarked! The image below is the bird in question. I've had to increase the exposure post capture with photo-editing software as the original was under exposed in the changeable weather conditions, apart from the previously mentioned song, the following features are visible from the image. A yellow wash around the face, including the supercillium with this continuing onto the upper breast. A split eye ring is visible but not particularly strong. A pale looking bill, especially the lower mandible. Legs appear much lighter than the typical black legs of a Collybita almost light brown (a feature also noted in the field). Underparts are clean and white in colour, contrasting with the olive green back and visible wing. Just visible is a slight tinge of a yellow hue around the flank/underwing. 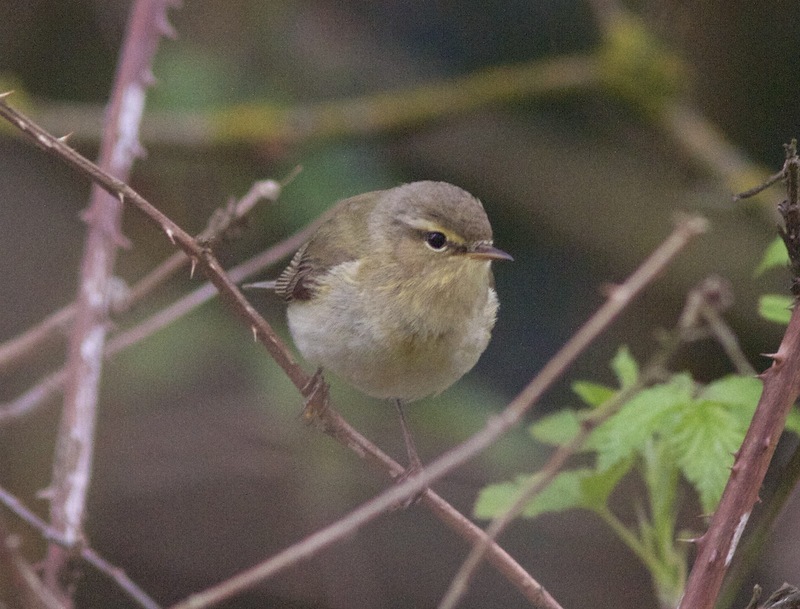 Having shared the image to get a couple of other opinions, the messages received back have been quite positive, pointing to an Iberian Chiffchaff (Phylloscopus ibericus). Also worthy of note is the *timing of the bird on the back of a large fall of southern european migrants on the Flats the previous day and the arrival of an Iberian Chiffchaff (Phylloscopus ibericus) at Flamborough on the 25th April details here: - it has also been noted the Flamborough bird does look remarkable similar in the photos to this bird. *RBA also reported the arrival of two other birds in the UK. Despite searching for the bird by the regular 'Wanstead Collective' that same evening and the following day, no further sightings of the bird have been recorded, that was until today (Monday 29th) when JL had this or another odd calling Chiffchaff in the same area - lets hope it's this bird, allowing one or two other people to confirm its Identification.